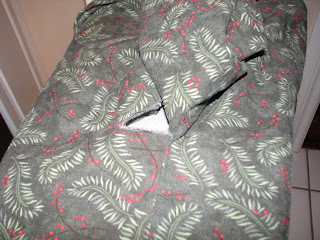 I am woefully behind in my sewing -- haven't even started my SWAP! My theory is that the flannel and fleece extravaganza has broken my spirit. My husband's pajama pants are finished, and he says they are the best pajama pants he has ever owned. That's not saying much, because a 6'6" man who is under 200 pounds has a hard time finding any well fitting clothes, let alone pajamas long enough to cover his ankles comfortably, while not being completely baggy everywhere else. So these are probably only the third pair of pjs he has owned as an adult that actually fit him comfortably. I made the first two pairs, also. 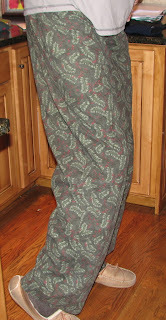 They were a quick, easy project -- as most pajama pants are -- but not at all exciting or challenging. The flannel is a very nice, thick, soft fabric with just enough stiffness that they hang nicely. 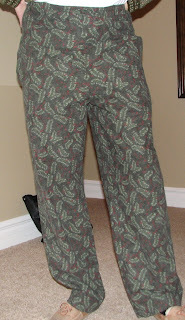 Steve has worn his new green "holiday" pjs almost constantly. He has rewarded my effort by spending nearly every minute at home wearing them and telling me how much he loves them. Almost immediately after counting the ways in which he loved them on Sunday morning, he caught the pocket on a door knob, ripping the pocket bag open, while also tearing a long slash along the cross-grain of the leg. I was so hurt that he would allow the most wonderful pajama pants in the world get damaged, that I told him they were unfixable. "Unsalvagable, I say! They will be hideous if I have to patch them!" Until last night. Then I felt guilty and fixed them. Other than the tiny patch, it's hard to see where it is and they are just pajamas after all. With school back in session and me back at work, it just seems that there is no time for sewing. I'm back to the 15-minutes-at-a-time thing, which can be frustrating, but if that's all the time I have, then I will take it! Report cards came out last week and the family was thrilled to see that our son's grades were considerably higher in the second quarter, with very respectable semester averages. School is hard for him, and after seeing his 1st quarter grades I devoted many evenings and weekends to tutoring him. Although I didn't get much time for sewing, the time spent with him clearly paid off for both of us. I started the minky "slanket" for my daughter and it's just aggravating working with that stuff. It is cut out and laying on my table, bleeding minky fleece particles everywhere. It makes much more of a mess than any other fleece I've worked with. I neglected to buy thread to match the robins egg blue, so I am at a standstill with that until I get to the store to buy thread. Although I am considering just using something complementary, or something that clashes, just to get it off my table.